Rosemary, a few years my senior, is a good friend and works with me as a volunteer at Rowe Sanctuary in Nebraska during the Crane migration. She and her husband are remarkable people, and we see each other for a week or two every spring. “Sure. I’ll do it.” At Rowe, I do anything I am asked if I am capable of doing it. I can clean toilets. Since that day, five years ago, there isn’t any public restroom I have used without scanning the urinals or the toilets for cleanliness. If I see a man cleaning one, usually a person of color, I feel some kinship. The man will never know that I’ve done his job. I don’t like the unnecessary junk thrown into urinals, the misses, the stains on the floor, and the paper that misses the garbage can. It’s gross, and the job doesn’t pay well. I did daily cleaning as a volunteer, but morning and night I guided people to see one of the world’s great migrations, and I don’t use “world” lightly, It’s on Jane Goodall’s top 10 list and my top three. Cleaning toilets was third in a line of cleaning up poop. I learned it as a fourth year medical student working in the NICU and general pediatrics. If one examined a newborn, and found the diaper soiled, one changed it and cleaned the baby. Period. No exceptions. It’s cruel and unprofessional to knowingly let anybody sit in their own urine or feces. I cleaned up after adult patients when I examined them, if they had soiled themselves. It took time, I gagged more than once, but it was relaxing to do something I knew was good. It’s not always fun being a tour guide, dealing with the public in a visitor’s center. I don’t walk into one today without knowing exactly what it is like to be behind the desk, to have to clean the place, and answer questions. Perhaps that is why I had I thought my experience interesting, on successive days, with two tour guides in Alaska. 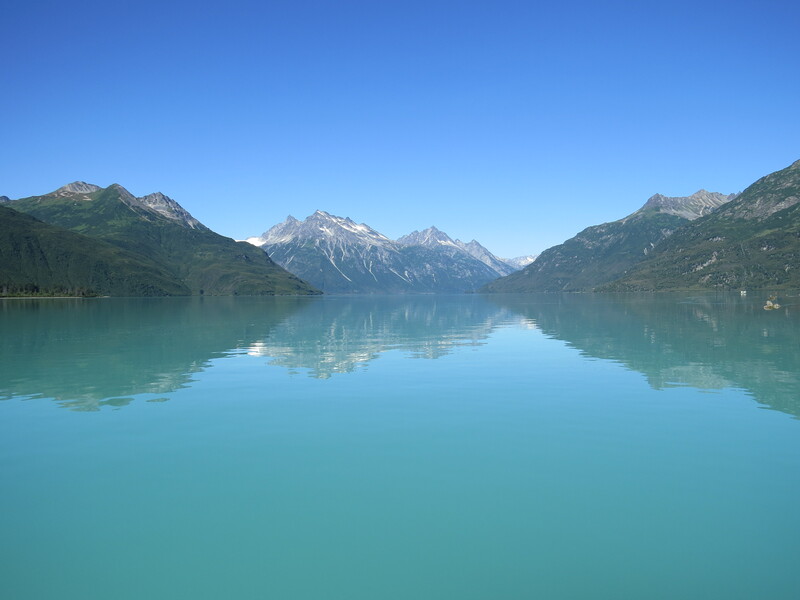 The first tour was to Crescent Lake in Lake Clark National Park. Our boat guide to see the bears was a man our age, a stone mason for 42 years, with one knee replaced and needing the other done, too. I wonder why those in Congress who want to raise the age for Social Security can’t understand that that most can’t do difficult manual labor until 70. I’m not far from 70, and I would have trouble. Then again, when one is in his 40s, with good health, money and connections, he doesn’t think about the day when his body starts betraying him, as mine has. I don’t think I must end my hiking and camping, but I’d be foolish to discount the possibility in the near future. Ted, Rand, Rick, and Donald don’t think in those terms. Bear viewing that day was poor. 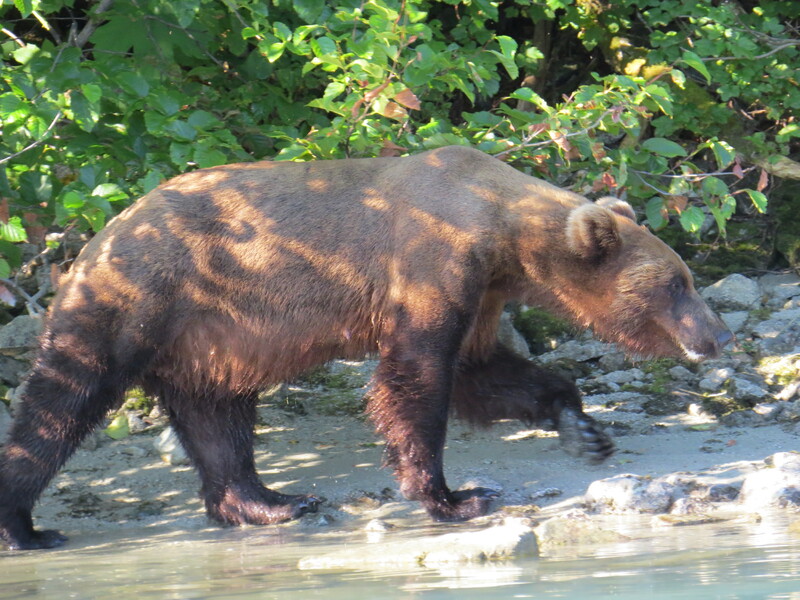 We went immediately to where there was a single sow, the only brown bear we would see, but saw great bear behavior for an hour. I have seen 18 bears in the Brooks Range, but I saw more behavior from this one in an hour than all of my sightings combined, often from a safe 800 meters, rather than from 50, if that. I knew the guide was unhappy with the paucity of bears, but the large numbers of fisherman, many with noisy motors, made it impossible. As a tour guide, I know the pressure guides feel to “deliver,” when nature calls the shots. That afternoon, I spotted a black bear and two cubs from 800 meters, and we had a delightful half hour of viewing when they came closer. Further away, where the guide hoped to find bears, all we saw was an unseen bear making trees move, the movement gradually uphill. My wife and I were excited, and I think the guide was glad. Sow with one of her two cubs. Crescent Lake was beautiful, the mountains clear, the weather perfect. I still felt sorry for the guide, but this is Alaska, not a zoo, which too many people expect when they go on wildlife viewing tours. Seeing wildlife is a gift. 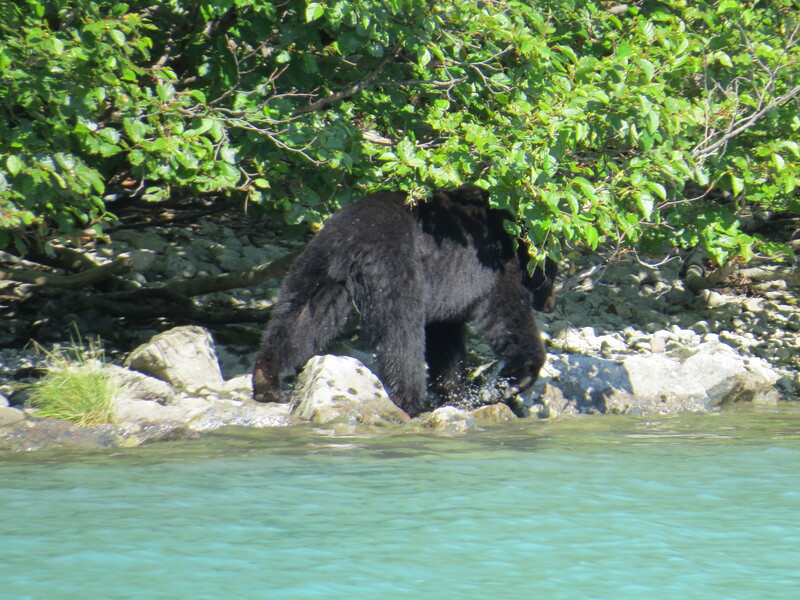 For the first time, I had seen black and brown bears the same day, interesting bear behavior, and spotted another at great distance. I helped. The pilot then did something wrong. He told me in front of everybody that this was fun, his philosophy was to have fun, and if he weren’t having fun, he would quit doing it. One never, and I mean never, berates a client in front of others. 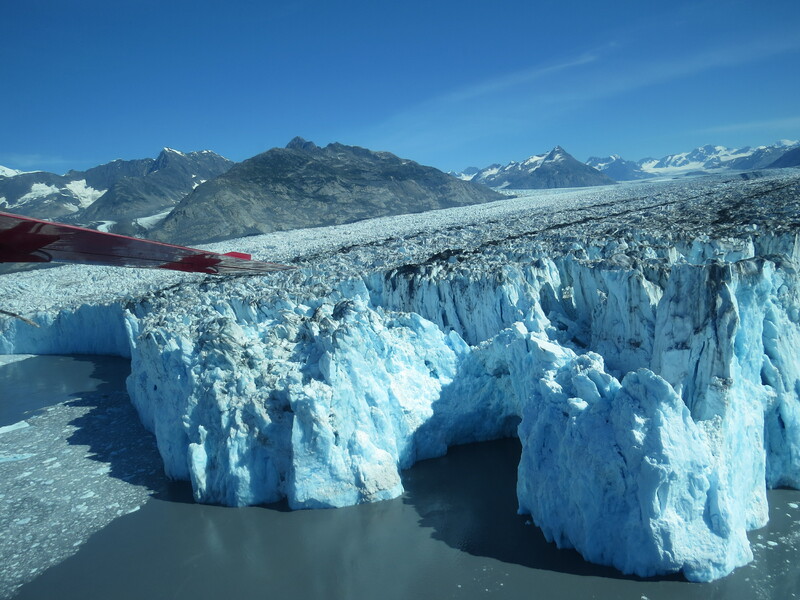 I have flown in remote parts of Alaska, landing in 15 different lakes or sandbars. I learned early that nobody who depends upon a plane in Alaska must ever be late. I should have said that. His job was to ensure people had a safe tour and hope they had a good time. That’s what I tell clients when I guide. The pilot was knowledgable, although I could have done without a discussion of his personal life. Later, he played music, neither my kind nor appropriate. I stayed quiet, not about to get chastised again. My wife, however, did have a discussion with him about turning off the music. Note to music lovers: if others complain, don’t ask “you don’t like it?” They don’t. That’s what headphones are for. At a stop on a lake to briefly deplane, the pilot neither said how long we would stay nor counted heads over and over, as I would have. 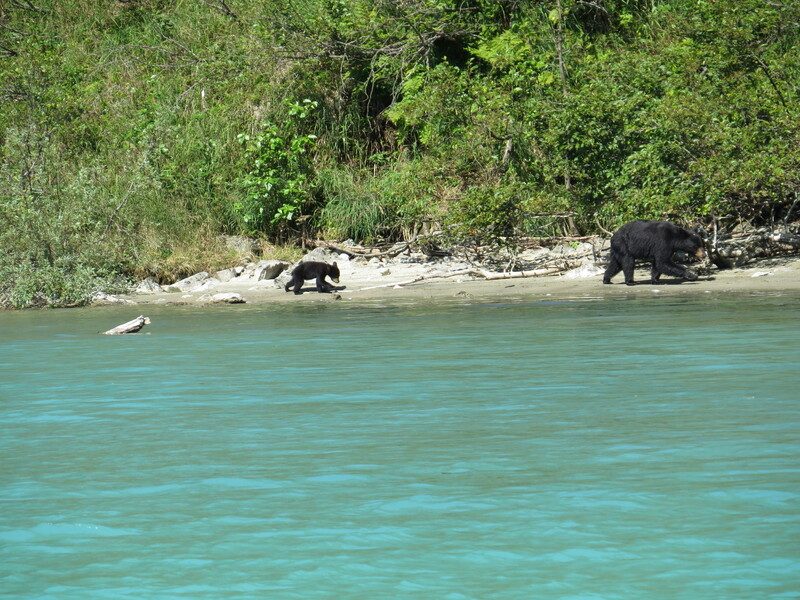 This was bear country, and few tourists knew not to wander far. Indeed, wildlife was hardly mentioned until near the tour’s end, although I did see fifteen mountain goats. 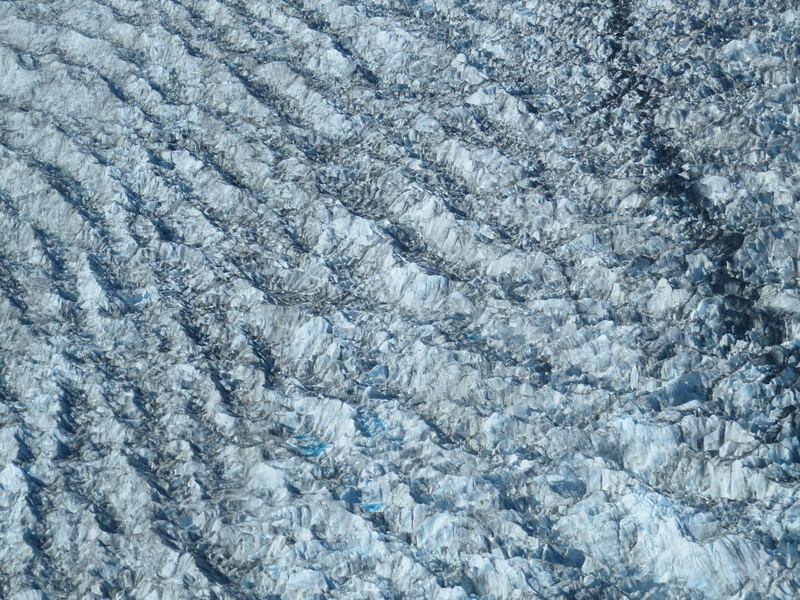 Pattern on glacier from the air. 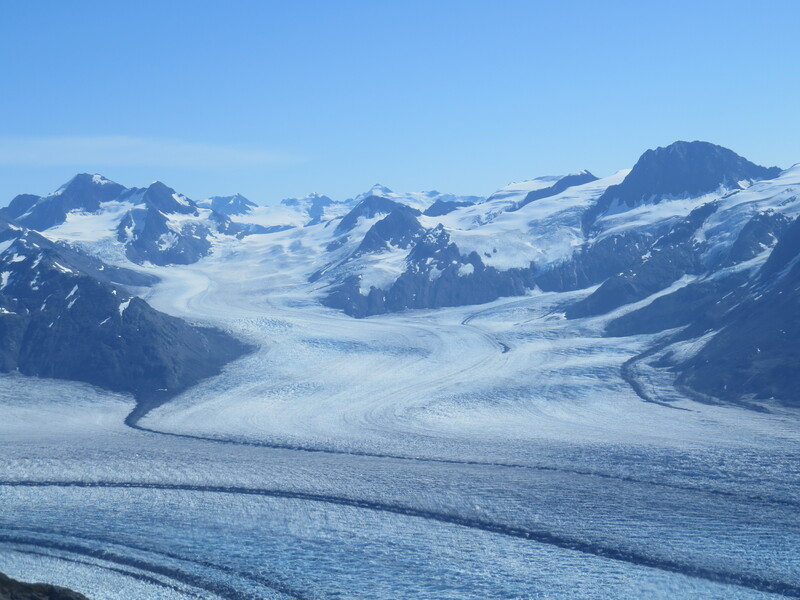 I learned about Alaska’s glaciers. But the other things I learned were a far more important. They will make me both a better tour guide and a better person, even if I don’t have 25,000 flight hours, haven’t flown for Exxon or rich folks, and have a different take on what is fun. I’ve missed a lot, but I’ve been around. I tipped both guides well, including the pilot. Once a year, somebody tries to tip me at Rowe. I tell them to please put it in the container in the visitor’s center. With luck, I’ll see it when I go clean the toilets. 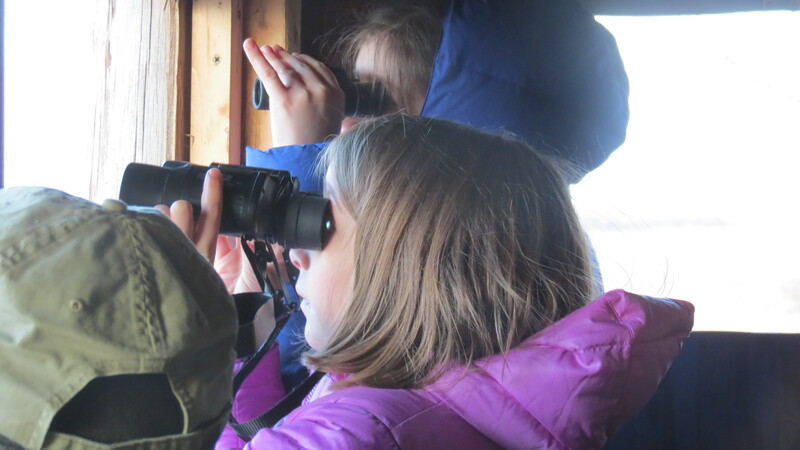 Two small reasons why I lead tours to the viewing blinds. Rowe Sanctuary, 2013. This entry was posted on August 20, 2015 at 15:53 and is filed under Uncategorized. You can follow any responses to this entry through the RSS 2.0 feed. You can leave a response, or trackback from your own site.